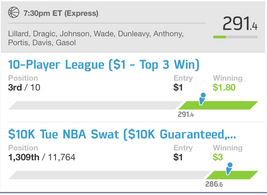 I had 1 of my 2 Express Line Ups Cash on Tuesday Night. I also ended up entering the nightly Free Roll and put in a $2 After Hours Line Up when I found out that S. Curry was indeed a scratch. 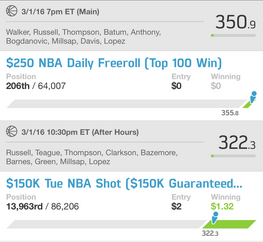 The $2 /$150K After Hours NBA Shot did not fill until the very end and had quite a few duplicate line ups. My entry bounced around from a 0 win, up to $7 and held at $2.35 for a while but settled at a $1.32 (that’s the first time I ever won less than I paid to enter). 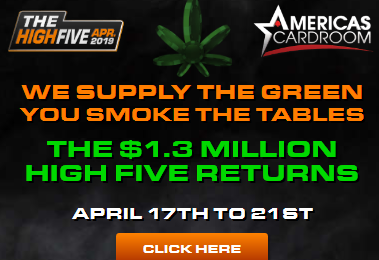 First place won by a 348.50 score and was shared by 98 players, each won $404.90. 2 players split 2nd place for a $100 payout. Who were the difference makers on the winning line ups? Those guys made all the difference for the big winners Tuesday night. The Wednesday NBA slate has 11 NBA games. I using these line ups tonight on the Express $1 / $10K NBA Swat. I’m using this line up on the Late Night $1 / $10K NBA Swat. There is a $250 Free Roll tonight on Fan Duel starting at 7PM using the full 11 game NBA Slate.